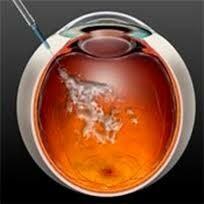 Anti Vascular Endothelial Growth Factor (VEGF) is the treatment of choice for wet macular degeneration. People suffering with wet AMD have hope with anti VEGF drugs offering the most effective treatment. Wet AMD is more devastating to vision and progress faster than dry AMD. In patients with wet AMD, leaky blood vessels invade the vessels that run underneath the retina to provide nourishment known as the choroid. These abnormal blood vessels appear in this area because the retina perceives low blood flow and releases a substance that promotes new blood vessel growth in the region. This substance is VEGF. In the presence of VEGF, small capillaries grow in response to a need for increased blood flow. These capillaries do not grow normally and as a result, they are not sealed properly. Instead, they leak blood throughout the area. Leaking blood, blood components and proteins damage the retina by causing scarring, which separates the retinal layers and allows fluid to flow into the empty spaces. Anti VEGF drugs are not new and are often used to treat cancer. Cancer tumors require ample blood supply to thrive. Researchers studied the mechanism of action for VEGF and its effect on the eye. Of the three drugs used to treat the eye, one is prescribed off-label, while the other two have FDA approval for intraocular use. All three drugs effectively prevent loss of vision. Many users experience an improvement in vision. These drugs are VEGF antibodies and their mechanism of action is to bind to the endothelial receptor cells to block the intake of VEGF. Macugen (pegaptanib) – This drug was approved in 2004 for use in patients with AMD. This drug is selective and binds only to receptors for the type of VEGF seen in AMD. Macugen is used less often than other options for treating patients with wet AMD. Lucentis (ranzibizumab) – The FDA approved this drug in 2006 for wet AMD treatment. This drug is non specific and blocks all forms of VEGF. The molecules are small enough for use on the eye and they decrease the risk of systemic side effects. This drug's affinity is greater than bevacizumab, its parent molecule. Avastin (bevacizumab) – The FDA approved this drug for treatment of colon cancer. It does not currently have approval for use on the eye. This drug is non selective, just like Lucentis. It is more cost effective and is approximately fifty times cheaper than Lucentis. There is no current evidence to show that Lucentis is any more effective in treating AMD than Avastin. A recent trial conducted by the NEI focused on age-related macular degeneration treatment and compared Lucentis to Avastin. The CATT study results were released in 2011. Treatments involving anti VEGF drugs require patients to receive monthly injections administered by a qualified ophthalmologist. The injection can lead to side effects in some patients. Reactions are typically mild and include a temporary blurring of vision and pain. The most serious side effect is endophthalmitis, or intraocular infection, and the risk of developing this condition is about 1 in 4,500 or approximately the same as undergoing cataract surgery.